In an email MacGregor described himself as a "proud racist"
A man has admitted he threatened to blow up Glasgow Central Mosque and execute a Muslim a day unless all Mosques in Scotland were closed. Neil MacGregor, 36, who described himself as a "racist", made the threats after watching an internet video of a British hostage being beheaded in Iraq. 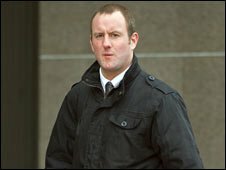 Glasgow Sheriff Court heard that he sent an email to Strathclyde Police and made a threatening phone call. Sheriff Andrew Mackie deferred sentence until later this month. At an earlier hearing MacGregor, originally from Derbyshire, admitted a racial breach of the peace. He telephoned and emailed Strathclyde Police to make the threats from a flat in Glasgow, between 30 January and 15 February 2007. The court heard that the email read: "I'm a proud racist and National Front member. "We as an organisation have decided to deal with the current threat from Muslims in our own British way, like our proud ancestors. "Our demands are very small. Close all mosques in Scotland. "If our demands aren't met by next Friday, we'll kidnap one Muslim and execute him or her on the internet, just like they did to our Ken Bigley." MacGregor then followed up the email with a call threatening to blow up Central Mosque. Officers searched the mosque but did not find anything suspicious. Muslim leaders have criticised the way MacGregor's case has been dealt with by the police and courts. Osama Saeed of the Scottish-Islamic Foundation said: "We believe that if a young Muslim had similarly been radicalised into threatening violence after viewing videos from Iraq, he would have been dealt with completely differently by the police and prosecuting authorities. "MacGregor can count himself lucky that his trial took place at the Sheriff Court rather than the High Court, where terrorism cases normally go, and the punishment is stiffer. "This apparent discrepancy has to be explained." MacGregor's defence lawyer Craig Dewar told the court: "He was emailed a video of a beheading from a friend and found it very upsetting. "He then took the decision to behave in this way. "He accepts that he was wrong to confuse this form of behaviour with that of the Islamic religion and is extremely sorry for what he has done." He added: "He has been in contact with figures from the mosque to personally offer his apologies."